iOS 11 is now available, either via iTunes or Settings > General > Software Update. I’ve spent the last few months documenting it for “Take Control of iOS 11” — which we’ve updated to version 1.1 to coincide with the official iOS 11 launch. If you’ve been following TidBITS, you’ve probably seen articles we’ve been writing about iOS 11, such as “A Prairie HomeKit Companion: What’s Coming in iOS 11” (7 July 2017), “ARKit: Augmented Reality for More Than Gaming” (28 July 2017), and “iOS 11 to Bring Do Not Disturb While Driving” (21 August 2017). Those articles hopefully whetted your appetite for iOS 11, but before you pull the trigger, here are 11 things you need to know. #1: Your Favorite Apps May Not Work — Don’t say you haven’t been warned! Adam Engst suggested this might happen in “Apple to Deprecate 32-bit iOS Apps,” (15 May 2017) and Marc Zeedar told you it would in “The Problem With Abandoned Apps,” (17 July 2017): apps that have not been updated to run in 64-bit mode remain on your device, but you’ll receive an error message if you try to launch them. If you’re running iOS 10.3.1 or later, check Settings > General > About > Applications to see a list of which apps on your device, if any, will not run under iOS 11. If you have some important ones on that list, see if there’s an update available, likely as a new app. If not, hold off on iOS 11 until you figure out a solution. But you don’t have to worry about the TidBITS News app! 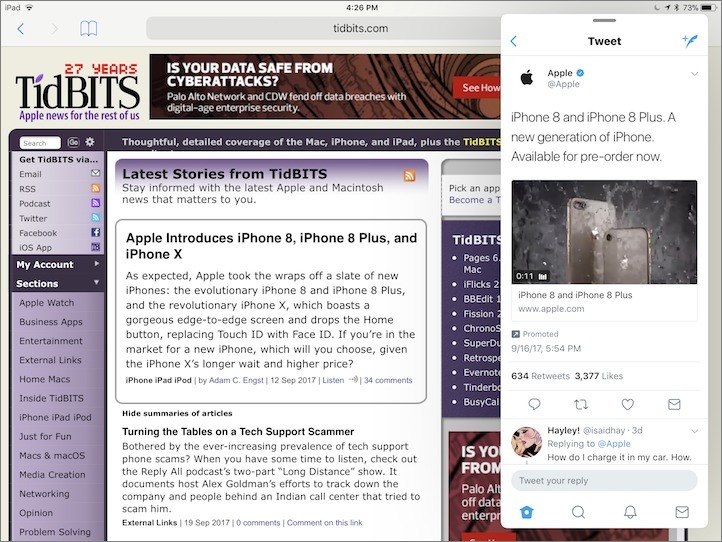 Thanks to Matt Neuburg, it should keep working for years to come (see “TidBITS News Shows How an Old 32-bit iOS App Becomes 64-bit,” 16 May 2017). #2: Some Features Are Missing — Three major features that Apple promised for iOS 11 at WWDC are missing: Messages in iCloud, person-to-person Apple Pay, and AirPlay 2 (see “iOS 11 Gets Smarter in Small Ways,” 5 June 2017). The idea behind Messages in iCloud is that it will store your messages and attachments in iCloud (where is it storing them now? ), making sync more reliable. The feature was present in earlier betas, but Apple removed it midway through the cycle for unspecified reasons. In internal beta-tester documents, Apple has vowed to bring it back later, but the company has said nothing to the general public. Personally, I was skeptical of the feature, since it counted against your iCloud storage quota and attachments to conversation can get big. No other messaging service charges its customers for such basic functionality, and maybe someone at Apple realized that this was going too far. Apple has also delayed person-to-person Apple Pay payments. The concept is that you can use an iMessage app to send money directly to another person via Apple Pay. Received money will be stored on a virtual Apple Pay Cash Card. It’s uncertain what the holdup is, but needless to say, financial products are complicated, so it’s not entirely surprising. Also, AirPlay 2 seems to be missing. Apple says AirPlay 2 will let you manage receivers with the Home app, output audio to multiple receivers, and work more reliably overall. However, based on my own testing, as well as AppleInsider’s, it doesn’t seem to be implemented yet. Strangely, Apple mentions AirPlay 2 in the developer release notes for tvOS 11. Perhaps it’s implemented in tvOS, but not iOS? I suspect we’ll learn more whenever Apple launches the HomePod smart speaker. We’re as frustrated by the delay of these features as you are, and I’ll update “Take Control of iOS 11” as soon as they’re available. #3: Be Wary of New Video and Photo Formats — By default, iOS 11 will capture videos and photos in the new HEVC and HEIF formats — assuming your device has an A10 Fusion chip or better. That means the iPhone 7 and later, and the 2017 iPad Pro models. As Glenn Fleishman explained in “HEVC and HEIF Will Make Video and Photos More Efficient” (30 June 2017), these formats provide a host of advantages, most notably reduced file sizes, but they have one big disadvantage: a general lack of compatibility throughout the industry! Windows computers can’t read these formats yet. Nor can Apple products running operating systems before iOS 11 and macOS 10.13 High Sierra. Images I’ve captured in HEIF on iOS 11 can’t be viewed at full resolution when synced to my 10.12 Sierra-based Mac via iCloud Photo Library. Apart from iCloud Photo Library, this shouldn’t be a major issue because exporting from Photos in iOS 11 and High Sierra generates files in standard formats. And if it is a problem, you can still capture images and videos in the JPEG and H.264 formats in iOS 11 by going to Settings > Camera > Formats and selecting Most Compatible. Control Center has been reduced from two or three pages in iOS 10 to a single page in iOS 11. That should reduce some confusion. You can now customize Control Center to a certain extent in Settings > Control Center > Customize Controls. Most notably, you can add a variety of Apple-provided controls — it doesn’t seem that independent developers can provide Control Center buttons. 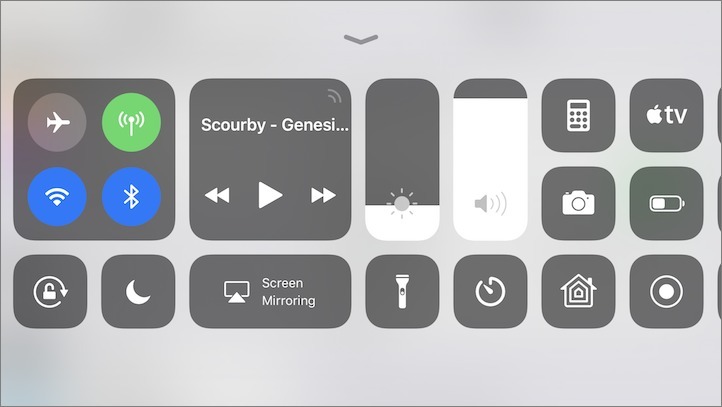 And although you can remove a few default controls, others are fixed: the networking platter, the media platter, Orientation Lock, Do Not Disturb, Screen Mirroring, Brightness, and Volume. Modify which Controls appear and in what order in Settings > Control Center > Customize Controls. I find three of the new controls are particularly useful: Low Power Mode, Screen Recording, and Apple TV Remote. Yes, there is now an Apple TV Remote in Control Center, with no app installation required. It may be my single favorite iOS 11 feature. 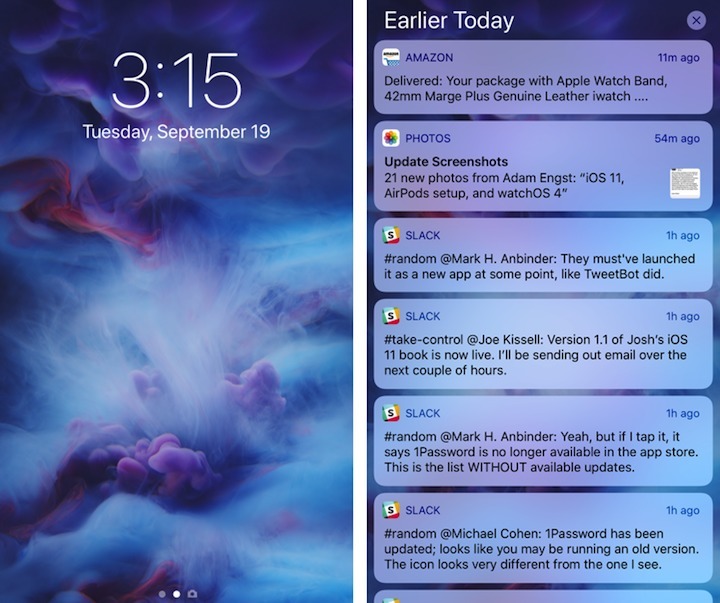 #5: So Long, Notification Center — In a move that seems obvious in hindsight, Apple has removed Notification Center in iOS 11, integrating its functionality into the Lock screen. Here’s how you get to notifications now. When your device is locked, the Lock screen shows only new notifications. To reveal past notifications, you can either swipe up on the Lock screen or swipe down from above the top of the screen, just as if you were pulling down Notification Center. When your device is unlocked, swipe down from above the top of the screen to reveal the Lock screen and all of your notifications. 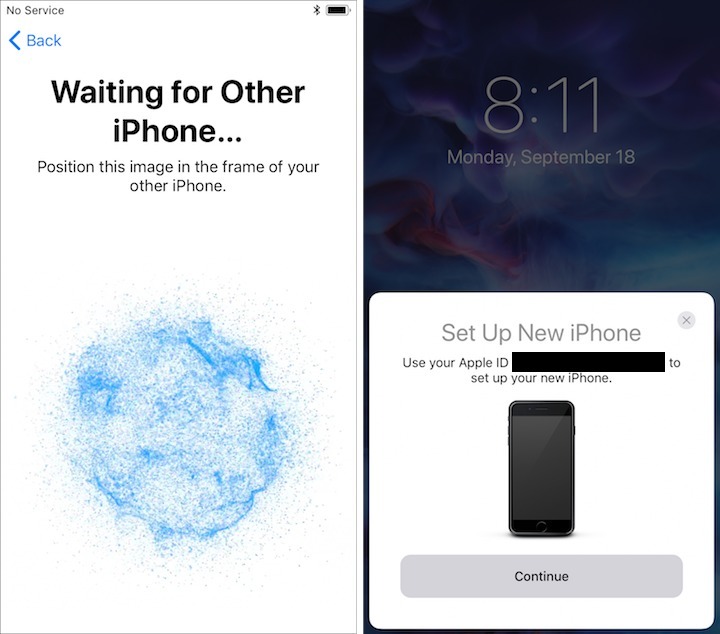 This doesn’t actually lock your device — either press Home or swipe up from below the bottom of the screen to return to where you were. #6: iPad Multitasking — Apple focused on the iPad experience in iOS 11, giving it more unique interface features and redesigning its multitasking system. 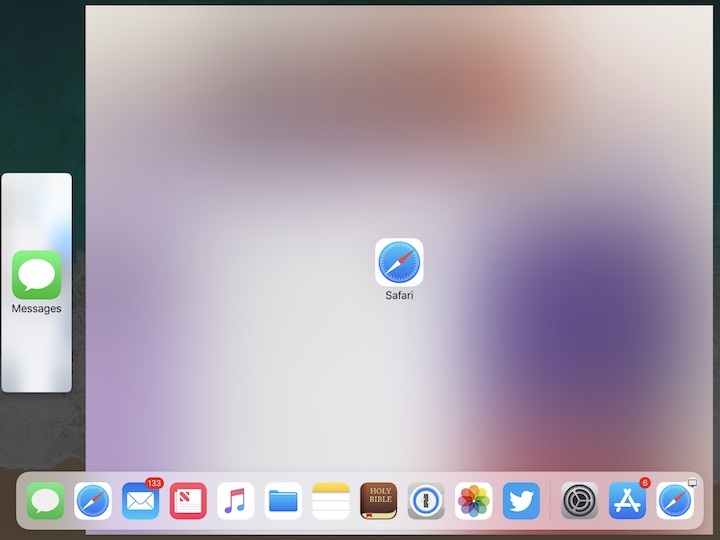 The star of the new multitasking approach is the redesigned Dock, which looks and works more like the Mac Dock. It can hold up to 15 apps and has a section to the right which displays recent and frequently used apps. That’s also where Handoff apps now appear on the iPad. While in an app, swipe up from under the bottom of the screen to display the Dock. Drag an app icon from the Dock onto the open app. From the Home screen, start dragging any app icon, and then, with another finger (perhaps on your other hand), tap another app’s icon on the Home screen or in the Dock to open it, then drop the first app. Perform the same actions starting on the search screen, or by switching apps with the Command-Tab app switcher if you have a keyboard attached. If you drop the dragged app on the main window while it’s showing its vertical lozenge, it opens in Slide Over, which overlays the main app on the right side of the screen. Convert a Slide Over app to Split View by dragging up on the bar at the top of its window. However, if you keep dragging that lozenge to either the left or right edge of the screen, the view changes to indicate that dropping it will open in Split View. It’s great that you can now position the new app on either side. There’s so much going on with the iPad in iOS 11 that I dedicated a full chapter of “Take Control of iOS 11” to it. #7: Instant Notes — If you have an iPad Pro running iOS 11, you can tap the Lock screen with an Apple Pencil to create a new note in the Notes app (the screen must be awake, and I’ve found a second tap is sometimes necessary). However, you don’t need an iPad Pro and Apple Pencil to make an Instant Note. If you add the Notes button to Control Center on any iOS device, you can tap that button to create an Instant Note when your device is locked! You can adjust Instant Notes’ behavior in Settings > Notes > Access Notes from Lock Screen. The default is Always Create New Note, but you can also set it to resume the last note you worked on, which would be handy if you’re taking notes in a meeting or class. #8: Explaining Instant Markup — Every year, Apple introduces some vague set of features under a single marketing term, which I have to figure out how to explain. Instant Markup is this year’s entry. The iOS 11 release notes imply that Instant Markup means that if you tap an Apple Pencil to an iPad Pro, you can mark up whatever is on screen. That’s not true, and again, you don’t need an Apple Pencil. Take a screenshot by pressing Sleep/Wake and Home. A thumbnail appears in the lower-left corner of the screen. Tap it to draw on it with markup tools. Open a photo in Photos, tap Edit, tap the ellipsis button, and then tap Markup to draw on a photo. 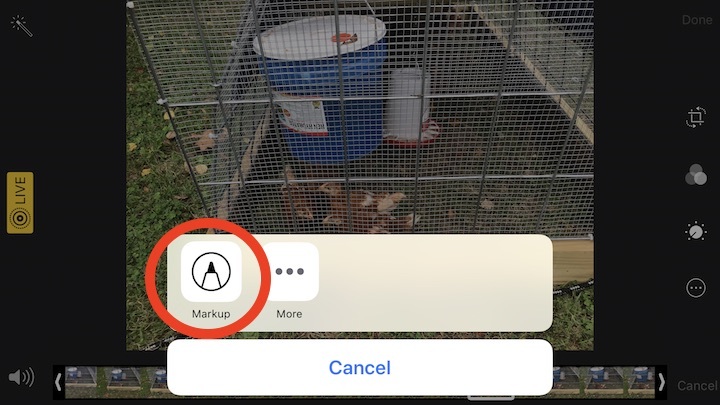 In Safari, tap the Share button, then Create PDF, and then the marker icon in the upper-right corner to mark up the page as a PDF. In iBooks, tap the marker icon while viewing a PDF to mark it up. Don’t get me wrong — it’s great that this functionality is available throughout iOS now. It’s just that Apple’s marketing is a bit misleading, and how you access it is inconsistent. #9: Emergency SOS — This new iPhone-only feature is important, but be careful with it. Press the Sleep/Wake button five times in rapid succession. You should see three sliders: Slide to Power Off, Medical ID, and Emergency SOS. Don’t touch the Emergency SOS slider until you’ve finished reading this section! First, just by accessing that screen, you have deactivated Touch ID (and presumably Face ID on the upcoming iPhone X). In many jurisdictions, the law says you can be compelled to unlock a device with a fingerprint but not a passcode. Keep that in mind, but remember that law enforcement and border guards can make your life miserable if you refuse to provide a passcode (see “Getting Your Devices and Data Over the U.S. Border,” 14 April 2017). As you expect, the Slide to Power Off slider shuts your iPhone off, and the Medical ID slider displays your Medical ID, which you can configure in the Health app, in the Medical ID view. What does that scary red Emergency SOS slider do? First, it calls emergency services — 911 in the United States. After the call is completed or cancelled, it sends a text message to your emergency contacts and shares your location with them. Emergency SOS Josh Centers has made an emergency call. You are receiving this message because Josh has listed you as an emergency contact. You set up your emergency contacts in Settings > Emergency SOS. After it notifies your emergency contacts, it displays your Medical ID, presumably to help any emergency responders. Remember: five quick presses of the Sleep/Wake button could save your bacon. It’s worth trying it to make sure you know what’s involved, but don’t slide that Emergency SOS button unless it’s a real emergency. We hope the feature doesn’t cause too many errant calls. #10: Offload Apps — Apple has long been stingy with storage space on iOS devices, and it has always been difficult to manage storage in iOS. iOS 11 improves the situation, thanks to a new storage management screen, which you can find in Settings > General > iPhone (or iPad) Storage. It offers suggestions for various things you can do or enable to save space. But I want to point out a specific new setting, which can also be found in Settings > iTunes & App Stores: Offload Unused Apps. This setting automatically uninstalls unused apps, but retains their data. If you later reinstall the app from the App Store, it’s as though you never deleted it! The only reason not to enable this setting is if you have way more storage space than you’ll ever use. For the rest of us, it can free up space with no risk of data loss. #11: Quick Start — It’s new iPhone season, and while setup isn’t a great hardship, it is the most time-consuming part of getting a new iPhone. For years, you’ve been able to set up an Apple TV automatically by placing an iOS device near it. Now you can finally set up iOS 11 devices the same way! So, if you have a new iPhone 8 on the way, for instance, I highly recommend upgrading your existing iPhone to iOS 11 before it arrives. Then, when you set up your new iPhone, you’ll save yourself from entering Apple ID credentials, Wi-Fi passwords, and the like. Just follow the onscreen prompts at setup or check out the What’s New chapter of “Take Control of iOS 11” for instructions. I hope you found these tips and highlights helpful, and check out “Take Control of iOS 11” for even more iOS advice! So here is ANOTHER reason it was stupid to remove apps from iTunes... ALREADY! Go to Settings, as the article says, and see the apps that are not compatible. If iTunes supported apps, I would then just go to those apps in iTunes and delete them. Now, there is NO WAY TO EASILY delete them! Sure, I can now swipe left, search for a name, and delete.... and then return to the buried Settings to find the next name and repeat... and repeat... for all 13 on my list. I haven't found that setting yet. Do you have a place to look for it? Found it but I have been deleting apps that before the update I would delete on the iPhone then go the Mac and delete it in there. If I didn't it would reinstall it's self when I plugged the iPhone in. They are not now. You probably have had the feature in the states for a while but up here in Western Canada they finally got around to giving us the feature of making calls via wifi. Now they have to really catch up to other smartphone vendors by allowing two phone numbers on the iPhone. A feature that should have been on iPhones three years ago. Yeah, it's been standard on all four carriers for a while, but it took Verizon forever to get on board. I'm still on iTunes 12.6. I have over 60 iPhone apps that won't work with iOS 11 and want to clean them up. I've deleted them in iTunes. Is there a way to force them to be deleted on the phone? Or do I have to manually delete them there too? "Flashlight should remember the color it was last used with. Because in the dark, if you start with white, your night vision will be impaired for half an hour. Flashlight should start with red, if it was last used with red. So, you can prepare your watch for your night shift." Here’s a trick we’ve just learned. If you put your watch in Theater Mode (tap the mask button in the Control Center), the flashlight will default to red when you turn it on. Theatre mode? Mask? I don't see either in the control centre on my phone, or in the list of customizable controls. That's Theater Mode on the Apple Watch. Swipe up from the bottom of the screen and tap the icon with the happy/sad masks. It silences the watch and turns off the wake on raise feature so you don't light up when you stretch. The emergency SOS on my Canadian phone works differently. It sounds a siren, starts a numerical countdown from three seconds, and shows two buttons, a red one labelled "stop" and a white one labelled "cancel". Seriously? That’s shockingly different. What do the buttons do, since they sound like the same command? I have no idea and I didn't dare try it, because there is usually no way to cancel a 911 call. But I just read that this screen is not the default. I thought that to enable emergency calls, I needed to switch on Settings>Emergency SOS>Auto Call, but it turns out that the function you described is the default and auto-call switches on the function I described. Ah, interesting. So you’d actually made the feature more aggressive about calling by flipping that switch. Yes, the switch might more sensibly have been labelled "paranoid mode." After upgrading to iOS 11 I no longer see the extended keyboard in landscape mode (iPhone 7), for instance, I have to go to the numeric pad to type a comma. I miss the feature rather much and have not found a way to reconfigure it. Am I the only one with this problem? No, you're not. And it's the number one reason I bought an iPhone 6s Plus. I absolutely hate this. So much harder to type. Can't fathom why more people aren't screaming bloody murder. Have at least temporarily installed the Gbord Google keyboard, which is pretty good. 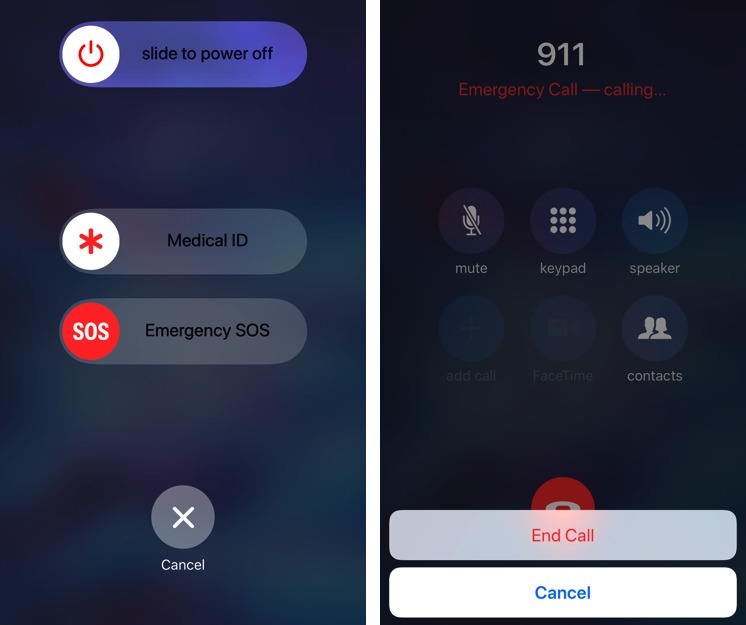 Ré activating “Emergency SOS” in iOS 11: not sure how widespread this is but here in California we are advised to report emergencies via cellphone not by dialing 911 but instead using a local emergency dispatch number. Any idea how this should be addressed? I don't think there is any way to change what Emergency SOS dials, I'm afraid. It seems odd that Apple would have done something that wouldn't work right in California, so perhaps they know something we don't. Not that dialing 911 doesn’t work—it does. Just that dialing local OPD emergency number (510.777.3222 in Oakland) routes call directly to local dispatch whereas 911 gets routed through CHP dispatch in Vallejo. In this instance I would be surprised if Apple knows something “we” do not. I think that's true in every state. Since calls placed to 911 from cell phones don't have an associated location, they go to statewide dispatch that can ask your location (my guess is it knows which state you're in by which cell tower you're connected to). Land lines have an associated location so calls to 911 go to the local dispatch. I think in a couple of years, cell phone calls will be routed to local dispatch by using location data from the phone (there are still some "feature phones" that don't have GPS and other location-determining capabilities). I think VoIP systems based on hardware (as opposed to an app), can/should also have their location like a landline. The university where I work is switching to a VoIP system and the building and room number is recorded for E911 use (the phone will work on basically any network jack on campus but if you move it, you're supposed to let the telecom department know). Oh good, I'm glad to hear that 911 should work, even if perhaps not quite as quickly or effectively. Speaking of Apple Pay, I was checking charges on my credit cards this past weekend, which I do once/week online, and I found over $400 in fraudulent charges on a MasterCard, spread all over the country. So naturally, I contacted MC to go through the process of identifying the nine charges I was disputing and I was a bit taken back when the first thing the CSR asked me after we'd established my bona fides was whether the card is linked to Apple Pay. It is, rather was, the card has now been canceled. So have I missed finding out that Apple Pay has been mixed up in a credit card theft scheme or was this CSR just clairvoyant? When I pressed him, he wouldn't commit to saying that an unusual number of their fraudulent charge complaints have been tied to Apple Pay. I tried Settings > General > About > Applications, but it only shows a count of applications. There is no list. This is on an iPhone SE running version 10.3.3. What's the deal? That means you don't have any 32 bit apps installed. Thank you, that had me going too. me too, good to know, maybe should be in the article above. Thank You for your concise information (as always) R.
I sent email to apple.com/feedback requesting this option be restored. If users voice displeasure maybe Apple will reconsider. For me, using a 10.5-inch iPad Pro and Smart Keyboard, why would they make the Cmd-Tab app switcher include apps that have been swiped away on the multi-tasking screen? I wasn’t able to figure out the comments above that make it sound like swiping away apps doesn’t actually “quit” them any longer, but regardless, if I’ve swiped an app off the multi-tasking screen, it shouldn’t appear via Cmd-Tab any longer, right??? In the iOS world, this behavior makes sense. You should never think about whether an app is running or not because iOS manages application states behind the scenes. Once you're not looking at the app, you have no way of knowing how active it is, nor should you. That's true even if you force quit an app (which you should do only if it's crashed or otherwise misbehaving, because doing so hurts performance). So no, I think Cmd-Tab is working properly in this case. I do find which apps show up on the right side of the Dock to be a little weird. I help people with their Apple products every day, for my living. I highly doubt that any of my clients will *ever* understand how the behavior makes sense “in the iOS world”, because force quitting an app for the wrong reason “hurts performance”. In my experience, >90% of iPhone users still think they’re supposed to force quit all their apps every time they’re done using the device, because it “saves their battery”, and I doubt that any of them notice whatever performance hit that practice creates! Get my point? We technologists need to stop assuming that the vast majority of users are interested in, let alone capable of understanding, esoteric paradigm shifts like this. The average computer user has learned how things work on their device, and is completely frustrated when things change abruptly, for no apparent (let alone comprehendible) reason! There's no reason Apple should design UI around a behavior that's intentionally hidden because it actively hurts performance and battery life. If anything, they should redesign the UI to prevent people from wasting their time and battery life force-quitting apps! "intentionally hidden because it actively hurts performance"
I've seen this claim repeatedly, but have not seen a justification for this assertion (hurts performance). Obviously it "hurts" the performance of the app in question, since it presumably has to start up from scratch again later. But that doesn't justify the blanket claim. What am I missing? Here's a recent Daring Fireball post on this dead-horse topic. "That’s not how iOS works. The iOS system is designed so that none of the above justifications for force quitting are true. Apps in the background are effectively “frozen”, severely limiting what they can do in the background and freeing up the RAM they were using. iOS is really, really good at this. It is so good at this that unfreezing a frozen app takes up way less CPU (and energy) than relaunching an app that had been force quit. Not only does force quitting your apps not help, it actually hurts. Your battery life will be worse and it will take much longer to switch apps if you force quit apps in the background." It seems that your blanket statement is based on the unstated assumption that people think they should force quit apps for "good digital hygiene" (Gruber) reasons. That may, in fact, be true for the majority, but there are other reasons for force quitting which, I claim, might justify a slightly less absolutist version of this assertion. I know, I'm a weirdo. But there may be other edge cases out there with their own reasons for force quitting, which neither of us might imagine. And since this is a respected tech forum, I think that at least sticking an "in most cases" in front of the "performance" admonishment, or stating the assumption that it's based on, might be appropriate. I can't see why this is such a big deal, especially so many years in. Yes, there's reason that force-quit exists at all, and that's so you can close an app that's frozen, freaking out, or otherwise misbehaving. It's a troubleshooting technique that should be performed only infrequently. It is not, and never has been, equivalent to pressing Command-Q on the Mac. Apple has, for all normal uses and normal users, eliminated not just the need to quit apps, but also the need to ever think about it. Reducing cognitive load is good design, and it should be celebrated, not quibbled with! Anyone who puts thought into force-quitting apps regularly is not just wasting their own brain cycles, they're also acting in a way that will result in a worse user experience as apps take longer to launch and battery life suffers. "You don't have to quit apps in iOS" is the message that should be conveyed, full stop. If someone experiences a frozen app, they should be told how to deal with it by force-quitting, but that's a different conversation. In the Mac world, the equivalent might be the conversation about ejecting/unmounting external drives before disconnecting them or powering them down. You tell users how they should act — always eject a drive before disconnecting it — and only later, if they run into a drive they simply can't get to unmount, would you tell them that just pulling the plug probably won't hurt anything too terribly. I regularly force quit Mail on my iPod Touch. I'm an old retired OS developer who still prefers to get his email via POP on my desktop (Linux) machine. Since I'm not out-and-about much (and not at all for business reasons), I have no reason to have my iTouch periodically running a radio looking for and downloading new email. I do rarely (weeks) check email on my iTouch, but still eventually download it on my desktop. Thus in my case, force quitting Mail saves both battery and byte count on my data-capped satellite Internet connection. Considering those factors, I claim that I am actually "benefiting" my performance, taken as a whole. I think that manual setting has been there for as long as I can remember. I have always had it checked since I don't want to get disturbed by email notifications all the time. While I support your reasoning (force quitting should be fair game considering some of us do in fact want to remain in charge of our own devices), I think this is a poor example. Mail can be set up to remain quiet in the background without routinely force quitting it. My personal example for force quitting is the weather app. It's a poor performer and it's buggy. From time to time it will simply refuse to refresh and unfortunately it doesn't offer a simple way to force refresh (unlike Mail for example). So I routinely end up just nuking it. Basically, it can either behave, or it will be restarted. And I don't for a moment hesitate just because Apple deems "it shouldn't be necessary". In the real world, what isn't necessary is buggy or inconsistent behavior. Fix your apps, not the users. Yep, setting Mail to Manual is the solution to that problem and has been possible for years. If an app like Weather flakes out, it should be force-quit, and that's why the feature exists. In the past, I used to force-quit some navigation apps because it was hard or impossible to get them to stop using location services if you parked before they saw you were at your destination. But most GPS navigation apps now let you end navigation easily, so there's no need to whack the entire app. I’d be curious to see a poll of your readers to see how many of them still believe that force-quitting all your apps saves battery life, or at least see others around them doing it regularly. I definitely see it... All. The. Time. They’ve been told by misinformed people, yes, but the fallacy lives on. I tell them they don’t have to do it, yet no one thinks their device isn’t working well despite their efforts, so your claim that they’re clearly hurting either performance or battery life, is not as clear as you claim it is. Quite the opposite; they still believe they’re helping performance (or battery life at the least) by doing it! I stand by my original statement: the apps included in the Cmd-Tab app switcher in iOS 11 makes no sense, especially if I’ve force quit any of those apps (for whatever reason)! !